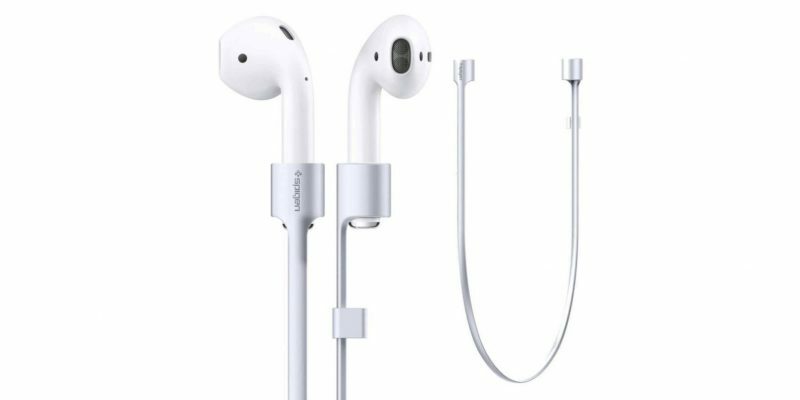 When Apple announced its wireless AirPods last week to compensate for the lack of a headphone jack on the iPhone 7, some observers commented on the "inevitability" of misplacing or flat-out losing one of the earbuds, which cost $159 a pair. California-based accessory company Spigen thinks it has a solution to that dilemma in the form of the AirPods Strap (patent pending), currently available for pre-order on Amazon for $10. The "tangle-free" cord attachment snaps onto the bottom of the arm of each earbud without impeding the microphones, and Spigen promises they "keep your AirPods in place around your neck, in your pocket, or anywhere you can hang a strap". While there's reason to question the logic of attaching a cable to a technology whose sole aim is to be cable-free, the accessory would seem to answer to the worry some undoubtedly have about keeping the AirPods safely together, although Apple's earbuds do come with a carry case for when they're not in use. The AirPods Strap is listed as having a release date of October 17, which is around the time Apple is expected to make the AirPods available to buy. Apple's wireless headphones offer users 5 hours of music playback, and the carry case doubles as a battery pack, holding an extra 24 hours of charge in a small, 2-inch tall frame. The AirPods feature Apple's new proprietary W1 chip, allowing them to pair seamlessly with the host device, activate Siri with a touch, and automatically pause playback on removal. It's like a person who wears glasses saying "I need glasses for my eyes, so these arm attachments that go over the top of my ears are unnecessary." There is no reason to question this. This is how it *should* have been done, IMO. I thought this was a parody. Seriously, the whole beauty of AirPods is they look pretty much the same - it looks from a laymans perspective all apple did was cut the cables. It's like the perfect design. Beautiful. Adding a wire is just absurd. It's ruining the look, and the whole point of just putting the ear pod in your ear. Nothing else. It's space age IMO. Surely, something like this should've been included with the airpods from Apple? "When you need wires again"
Wires are the new wireless! Notice the ribbon attached to it? What do you think that was for? LOL what a kludgy mess. They got rid of the headphone jack for THIS? What was the point of this if all you get is basically a behind-the-neck bluetooth headphones? Some one hasn't been paying attention. - additional space for larger SoC with increased performance. - additional space for improved tactic engine. - improvements to the home Button. Plus this cord is from a 3rd party. People can use their AirPods as intended. There are also a specific Beats models for other use cases: BeatsX, Solo3, Powerbeats3 - all with cords built in. Or people can optionally use the cord. At a desk you might be happy to go cordless. If walking/running you may want the security of the cord.